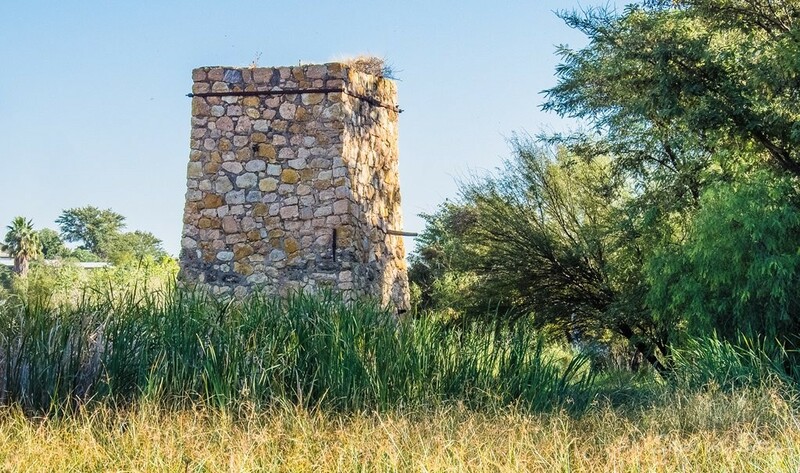 The Stone Tower in Outjo was erected in 1900 and served as a base for a windmill that pumped water from an underground aquifer. It was built by the German schutztruppe over a well and is 9.4m high. A wooden windmill drawn water from the well and pumped the water to a nearby cement dam. From there the water was taken by a pipeline to the Schutztruppe stables and barracks. During the German era Outjo was an important support base and a small fort was built in 1899. It was surrounded by a military station with barracks, sickbay, officers mess. All that remains today are the tower, the Franke House (today the Outjo Museum) and a small cemetery with graves of soldiers that fell during the Naulila Expedition.